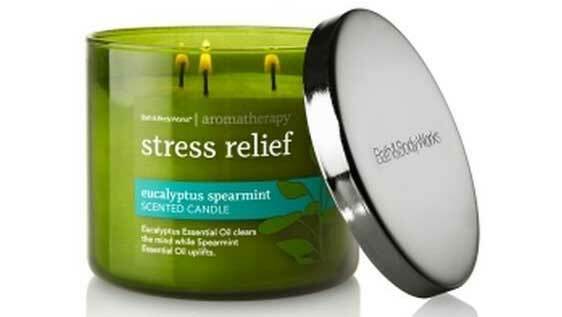 Bath and Body Works sells a ton of great stress relief candles. Their eucalyptus spearmint candle is a best seller with great ratings. The candle’s highly concentrated fragrance oils quickly fill the room with a smooth, subtle, and pleasant scent. Eucalyptus is a little-known oil that is packed with health benefits, especially for those with stress or anxiety. Aromatherapy utilizes essential oils to promote physical, mental, and emotional well-being. Eucalyptus is an essential oil that has gained a lot of popularity lately due to its many beneficial properties for those with stress and anxiety. This 3-wick candle has a diameter of about 4 inches and a height of about 3.5 inches. The estimated burn time is about 25 to 40 hours. You can buy one candle individually, or buy a 2, 3, or 4 pack. A eucalyptus candle that is spearmint scented makes a great gift for anyone with stress, anxiety, or just someone who is a candle enthusiast. The main difference between essential oils and perfume oils is that essential oils are not artificially created in a lab. Essentials oils come from natural sources and are though to offer more than just a pleasant scent. Essential oil candles are an inexpensive and effective way to get the benefits of aromatherapy right at home. Essential oils are believed to affect the parts of the brain that responsible for making people feel anxious, stressed, depressed, and fearful. They are believed to send a signal to the limbic system, resulting in a relaxation response. In some studies, exposure to essential oils for one hour was found to decrease heart rate and blood pressure. Many users note that eucalyptus oil alleviates mental fatigue. Some believe it accomplishes this by acting as a vasodilator, relaxing blood vessels, and increasing blood flood to the brain. It seems odd that essential oils can both calm and stimulate the mind at the same time. For this reason, they are sometimes referred to as adaptogens, because the can act differently or “adapt” depending on the body’s stress levels. This means someone who is feeling anxious may notice a calming effect, while someone who is feeling depressed and tired may feel an uplifting effect. Eucalyptus is known to have a wide array of other beneficial properties including anti-inflammatory, antiseptic, decongestant, antibacterial, stimulating, and other medicinal properties. To buy, get the latest pricing information, or to read more about this stress relief candle on Amazon, just hit the check it out button at the top of the page. If you have comments/questions about this candle, free to leave them below.